India had a nightmarish start to their tour of South Africa as they suffered a stinging 37-run loss in the one-day warm-up game here yesterday. India’s bowling and batting came apart at the seams in spectacular fashion against South Africa A — a bunch from whom only a couple have a realistic chance of playing in the World Cup — at the Willowmoore Park. Opener Virender Sehwag has been virtually ruled out of the opening cricket one-dayer against South Africa here on Sunday, compounding India’s problems ahead of the five-match series. Sehwag suffered a gash in the right ring finger before the start of a warm-up game in Benoni yesterday. Jyoti Randhawa and Jeev Milkha Singh continued their brilliant run as they ensured a strong Indian presence on the leaderboard at tied sixth place, three shots off the lead, at the midway stage of the $ 2 million UBS Hong Kong Open golf tournament. Hungarian soccer great Ferenc Puskas (79) has died in hospital following a long illness, his biographer Gyorgy Szollosi told said today. He is survived by his wife Erzsebet. “Ferenc Puskas died 7 am this morning. The exact cause of death was cardiovascular and respiratory failure triggered by pneumonia,” Szollosi said. The Punjab Council of Ministers today approved a cash award of Rs 1 crore for a gold medallist in the Olympic Games, Rs 50 lakh for the silver medallist and Rs 25 lakh for the bronze winner. It was a day of mixed fortunes for Indians as Saina Nehwal crowned herself the women’s champion, while Nikhil Kanetkar lost tamely to fifth seed Lee Cheol Ho in the mens final of the $ 10,000 Indian International badminton tournament at the Goregaon Sports Club here today. Mohammedan Sporting scored a facile 2-0 victory over Assam Rifles while former champions Border Security Force edged out Tata Football Academy by a solitary goal in the pre-quarterfinal league ties of the 119th Osian’s Durand Cup football tournament here today. Delhi defeated Himachal Pradesh 2-0 on the second day of the 43rd Junior National Football Championship (North Zone) at Malerkotla’s Zakir Hussain Stadium today. India had a nightmarish start to their tour of South Africa as they suffered a stinging 37-run loss in the one-day warm-up game here yesterday. India’s bowling and batting came apart at the seams in spectacular fashion against South Africa A — a bunch from whom only a couple have a realistic chance of playing in the World Cup — at the Willowmoore Park. After allowing the hosts to get off the hook and post a challenging 255 for eight, the tourists themselves pulled the plank from under their feet to be 82 for six by the 23rd over, and were eventually all out for 218 in 49.1 overs. The final margin might appear closer but it was because South Africa pressed in service some irregular bowlers. The only positives from the match were the strong statements made by comeback seniors Anil Kumble (2-31) and Zaheer Khan (3-43) with the ball and captain Rahul Dravid's stubborn 79. The first of five one-day internationals is to be played Sunday at Johannesburg. The Indians failed to deliver the killer punch in the South African innings after Kumble and Zaheer had helped them take a strong grip of the match. The final five overs leaked 68 runs and 96 came from the last 10, allowing South Africa A to recover from 116 for six. And with openers Wasim Jaffer and Sachin Tendulkar falling for only five runs each and the middle order of Suresh Raina and Dinesh Mongia departing for blobs, India were never in the contest despite Dravid holding fort at the other end. Fast bowler Dale Steyn did his one-day chances no harm with a haul of five for 22, his blistering pace and hostility proving too hot for the Indians. Since he bowled 10 extras, he actually conceded only 12 runs to Indians’ bat. Dravid kept one end going for 79 runs for 99 balls but most of these runs came against the lesser bowlers in the attack. Among other batsmen, only Mohammad Kaif (30) and Irfan Pathan (34) showed some intent of staying put with their captain, the latter backing it up with a good performance up front with the ball and figures of one for 38 from his nine overs. Nothing went right for India who suffered a setback even before the first ball was bowled. Vice-captain and opener Virender Sehwag was ruled out of the match after suffering a cut in the middle finger during practice before the start. Zaheer and Kumble then triggered a middle order collapse but half-centuries from Jacques Rudolph and Albie Morkel got the South Africans out of the hole. Rudolph hammered a thunderous 72 not out that came from 53 balls and contained seven fours and two sixes. The left-hander added 96 runs for the crucial seventh wicket with Morkel who made an equally pugnacious 57 with five fours and three sixes. Fall of wickets: 1-16, 2-44, 3-57, 4-114, 5-116, 6-116, 7-212, 8-232. Bowling: Pathan 9-0-38-1, Patel 9-3-63-1, Zaheer 10-1-43-3, Sreesanth 10-1-62-0, Kumble 10-0-31-2, Sachin 2-0-14-0. Fall of wickets: 1-10, 2-12, 3-67, 4-81, 5-81, 6-82, 7-166, 8-183, 9-194. Opener Virender Sehwag has been virtually ruled out of the opening cricket one-dayer against South Africa here on Sunday, compounding India’s problems ahead of the five-match series. Sehwag suffered a gash in the right ring finger before the start of a warm-up game in Benoni yesterday and it was revealed that the dressing on his wound would come off only on Sunday morning, barely hours before the day-night encounter. The Delhi batsman needed four stitches to close the gaping wound and did not play the warm-up match against South Africa A which the visitors lost by 37 runs. Although the team management said the injury was not serious, the fact that the stitches would come off only on Sunday makes it rather unlikely for him to take the field in the first game. While the team’s media manager Rajan Nair did not give a clear indication on Sehwag’s availability, Chappell’s statement gives the impression that the dashing opener may not be in the scheme of things for the first match. “His (Sehwag’s) injury is not serious as such but the stitches would come off only on Sunday morning and we hope the problem doesn’t extend beyond the first game,” Chappell said after the warm-up game in Benoni. The injury happened when Sehwag went for a high catch during practice before the start of the match. India are already without the services of Yuvraj Singh, a key member in the one-day squad, after he suffered a knee ligament injury on the eve of the Champions Trophy match against Australia in Mohali late last month. In case Sehwag does not play the match, India may have to choose between opener Wasim Jaffer, who seems to be a likely choice to partner Sachin Tendulkar, and wicketkeeper-batsman Dinesh Kaarthick. Captain Rahul Dravid, who has opened in one dayers in the recent past, could also be an option. There was, however, some heartening news for the Indian camp with coach Chappell having fully recovered from food poisoning which forced him to skip the team’s first practice session. Benoni: Indian coach Greg Chappell has sought to deflect criticism of the team’s disastrous show in the South Africa tour opener, saying the players had been pitted against quality opposition without adequate time to adjust to the local conditions. “It can happen, stepping out of airplane and playing in two days’ time against genuine quality bowling. But that’s the only way you are going to learn,” Chappell said in a stout defence of his players after the 37-run loss to South Africa A in the one-day warm-up game here yesterday. At the Fanling Golf Course in Hong Kong Country Club, overnight joint leader Randhawa shot an under-69 and Jeev a three-under 67. They were both seven-under 133 for 36 holes, and three shots behind Spaniard Jose Manuel Lara (66), who was at 10-under for two days. In the second place was little-known Frenchman Gregory Bourdy (66) and Australian Andrew Buckle (65) was tied third with Filipino rookie Juvic Pangunsan (65) and Chinese veteran Zhang Lian-wei, who scorched the course with the day’s best of seven-under 63. They were all tied eight-under 132 for two days. Two other Indians, Rahil Gangjee (70) and Gaurav Ghei (70), also made the cut and were tied 53rd at even par on the cut line. Indo-Swede Daniel Chopra climbed from tied 102nd to tied 44th with a four-under 67 and a total of one-under 138. However, Harmeet Kahlon (70) and SSP Chowrasia (72) missed the cut. Three big names missing the cut included Retief Goosen (71), Simon Dyson (70) and Johan Edfors (71). They all ended at one-over 141, one shot off the cut. Battling the winds, Randhawa started the day in shared lead with Jose Manuel Lara. But he had a very frustrating day with his birdies putts refusing to fall. He did well to tame the wind and manage pars for most part of the day and ended with a one-under 69. Miyazaki (Japan): Shiv Kapur continued his fine performance to card an even-par 70 and was placed tied 18th in the star-studded $ 200 million Yen Dunlop Phoenix Golf tournament. Kapur, playing in Japan only for the second time, seemed to have adjusted well and brought home a steady round for a total of even-par 140 for 36 holes. Puskas, dubbed “The Galloping Major”, was one of football’s all-time greats, winning league titles with Hungarian club Honved and with Spanish giants Real Madrid, with whom he also won three European Cups. “This is a real tragedy for Hungary and specifically for us, his friends. I am on the verge of tears... The biggest sportsman of the country is no more,” national news agency MTI quoted former international team mate Jeno Buzanszky as saying on Friday. Puskas was the inspiration behind the “Magical Magyars”, the Hungarian national side that sensationally beat England 6-3 in 1953, the first foreign side to win at Wembley. His international goal scoring record of 83 goals in 84 games for Hungary has been eclipsed recently, but remains among the most prolific in the world. 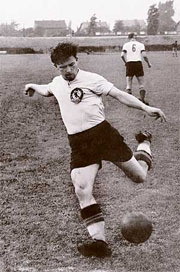 As the last millennium drew to a close, Puskas was voted the 20th century’s fourth best player by the International Federation for Football History and Statistics. He was a talismanic member of Hungary’s “Golden Team” that lost just one match — the 1954 World Cup final — in six years during the 1950s. That side was devastated by Hungary’s anti-communism uprising in 1956, after which Puskas went into exile. In 1958, he resurrected his career at Real Madrid where he formed a lethal strike partnership with Argentine-born Alfredo Di Stefano, winning six domestic titles and conquering Europe. Puskas scored four and Di Stefano three in Real’s mesmerising 7-3 European Cup win over Eintracht Frankfurt in Glasgow in 1960 — a match that has passed into soccer folklore. For the sportspersons from Punjab who represent India in the official World Cup or the World Championship (held every four years), Rs 21 lakh, Rs 11 lakh and Rs 7 lakh will be the cash prizes for winning the gold, silver and bronze, respectively. For those winning medals in the Asian Games or the Commonwealth Games, the cash prizes would be Rs 7 lakh, Rs 5 lakh and Rs 3 lakh for gold, silver and bronze, respectively. Likewise, the Council of Ministers approved Rs 5 lakh, Rs 3 lakh and Rs 2 lakh for gold, silver and bronze medal in the World Cup or the Asian Championship held every year or every two years. The cash prize would be Rs 3 lakh, Rs 2 lakh and Rs 1 lakh for gold, silver and bronze respectively in case of the National Games, Afro-Asian Games and the South Asian Games. In events for the handicapped, the cash prizes would be Rs 5 lakh for gold, Rs 3 lakh for silver and Rs 2 lakh for bronze medal winners. For team events, the prize money would be divided among the team members. 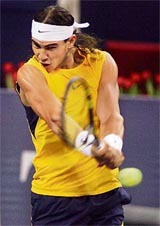 In the junior category, players would get 50 per cent of the above amount of cash awards. The Kolkata outfit outplayed their rivals for most part of the match except the closing period of the second half with Raman Vijayan (10th minute) and Harbinder Singh (26th) scoring for them at the Ambedkar stadium here. But the win may not be enough for Mohammedan to book a berth in the quarter-finals from the three-team Group A as they had lost 1-2 to Air India, Mumbai, yesterday. Air India need only a draw in their match against Assam Rifles tomorrow to make it to the last eight and join Mahindra United, Mohun Bagan and Sporting Clube de Goa. Left half Surojit Roy was involved in both the goals. First, he received a long aerial pass from Noel Anthony Wilson and unleashed a powerful left footer from the top of the box which goalkeeper Satbinder Singh fumbled to collect and a lurking Vijayan slammed it home. The second was a gem of a goal from a collective effort. After collecting an aerial ball from the right by Noel Wilson, Roy darted down the left flank and sent a pin-point cross which was perfectly connected by a Harbinder Singh header into the net. After a barren first half, Delhi forged ahead through a goal by Kulbhushan in the 78th minute. The second goal off a penalty was again scored by Kulbhushan in the last minute. Earlier, Jammu and Kashmir held Uttaranchal to a 2-2 draw after conceding an early goal. Uttaranchal’s Saurav Rawat scored the opening goal in the 30th minute but Vishal Bhardwaj of J & K equalised just four minutes later to restore parity. Another goal by Vivek Singh once again saw Uttaranchal taking the lead but Taufiq Ahmed’s opportunistic strike six minutes from the breather brought J & K back on even terms (2-2). The championship was inaugurated yesterday by the Sangrur DC, Mr S. R. Ladhar, who announced a grant of Rs 1 lakh for the stadium and Rs 20,000 for the organising committee.